As one of the largest and last intact wildernesses on Earth, Canada's boreal forest provides crucial habitat for millions of species, supports a thriving resource industry and, according to a new report, contains what could be Canada's — and the world's — best asset in the fight against climate change: wetlands. The report, released this week by the Boreal Songbird Initiative, highlights six distinct wetland areas within the boreal forest and calls on government and other groups with a stake in the forest to act now to protect them. "Unlike most of the world, the [boreal] wetlands are still very intact and pristine," says Jeff Wells, science and policy director with the Boreal Songbird Initiative. "There’s still the opportunity to get things right in terms of how they’re taken care of into the future." 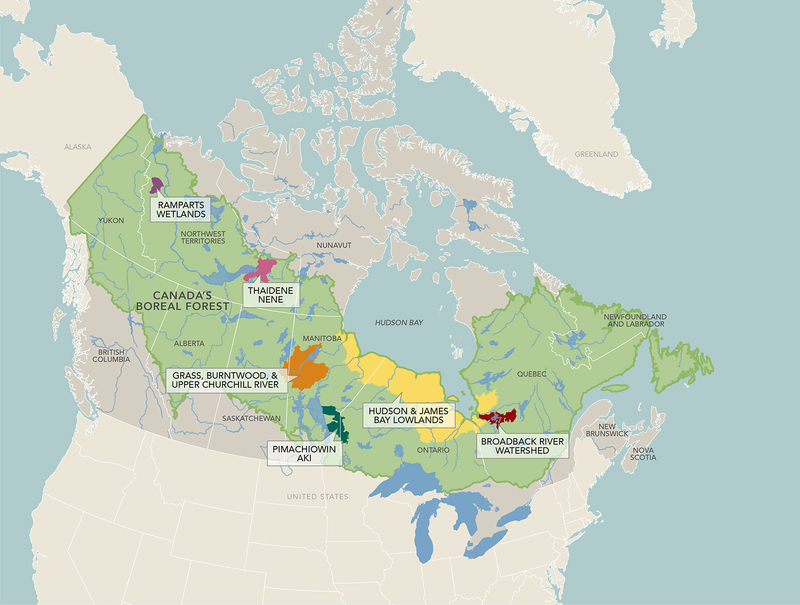 A quarter of the world's wetlands are found within Canada's boreal forest and cover a total area of 1.19 million square kilometres — larger than the province of Ontario. These wetlands help moderate river flows and cleanse polluted water, and support a complex web of species, from microscopic zooplankton to migratory seabirds to large mammals like moose and caribou. They also store massive amounts of carbon, particularly the boreal peatlands, a type of wetland formed by layers of undecayed vegetation. At minimum, the peatlands store 147 billion tonnes of carbon, equivalent to 736 years’ worth of Canada’s industrial greenhouse gas emissions, so it is in Canada's best interest to see those areas protected from development and fragmentation, the report notes. Wells says he's encouraged by recent efforts, many of them led by indigenous peoples, to study the role of the boreal in carbon sequestration and protect large swaths of the boreal. First Nations in Ontario and Manitoba have been trying for years to get Pimachiowin Aki, a vast tract of forest straddling the border between the two provinces, declared a UNESCO World Heritage Site and are hopeful that this will be the year their plans come to fruition, while in the Northwest Territories, discussions are ongoing around the creation of a new national park reserve, Thaidene Nene. "One of the things we’re most hopeful about is that provincial and federal governments will show strong support for these indigenous efforts and give them what they need to carry out their plans and be the managers of those lands," Wells says.